You've had an unlucky streak lately. Last week, your car was towed but seeing the 'No Parking' sign buried underneath all the snow was virtually impossible. This morning, you stubbed your toe on the way to the bathroom (ouch!) and then accidentally broke the full-length mirror. That's 7 years bad luck; 7 freakin' years! Sounds like you're really having a tough go at things bud, but we're here to help. We're giving you a foolproof way to be lucky and no, it doesn't involve a lame rabbit's foot or a trusty pair of underwear. It involves a faux-fur-covered, high-quality, and insanely comfortable hooded jumpsuit. 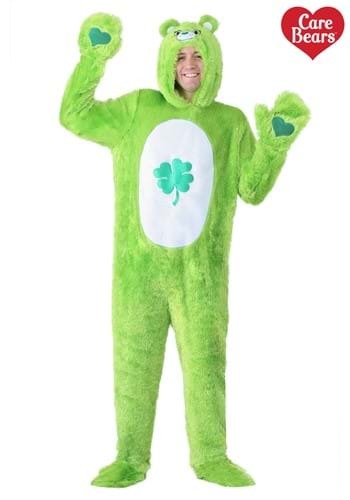 Your good fortune starts with the plus size Good Luck Care Bears costume. The plus size Good Luck Bear Care Bear's costume is a great option for unlucky adults or anyone who watched the cartoon TV show while growing up in the awesome 80s. It's a Made by Us design so it's expertly crafted from lush fabric and high-end materials. The furry jumpsuit has a full zipper in the back and an attached hood with an embroidered and soft-sculpted face. Conveniently, mitts are sewn onto the end of each arm while shoe covers attach to feet via stretchy, elastic bands. It's an officially licensed and exclusive jumpsuit you can only get right here! Everyone wants to hang out with a lucky guy, (or bear), with the hope the luck rubs off on them. Get your crew together and wear our Made by Us Care Bear costumes and venture out as a complete Care Bear group.